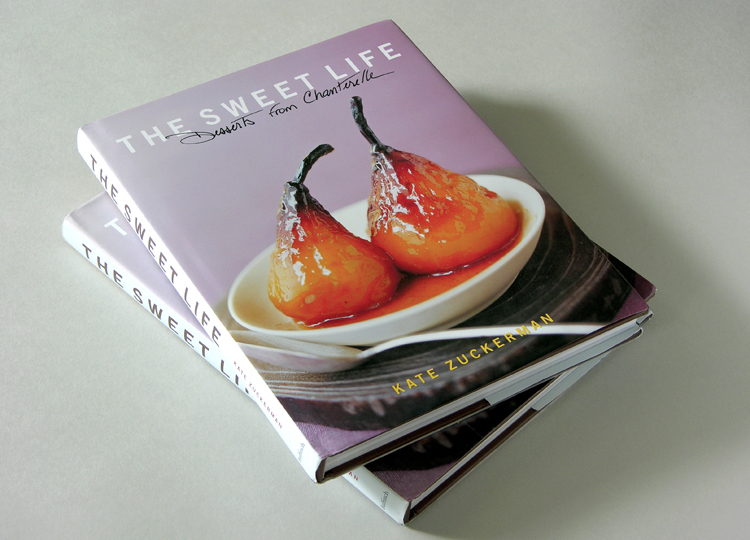 Yesterday afternoon I tried out a recipe from Kate Zuckerman’s fantastic book The Sweet Life: Desserts from Chantrelle. I couldn’t recommend the book more enthusiastically. I picked it up on a whim and I’ve since bookmarked a good dozen recipes I’m dying to try out. The book is beautifully designed and laid out by the Empire Design Studio. 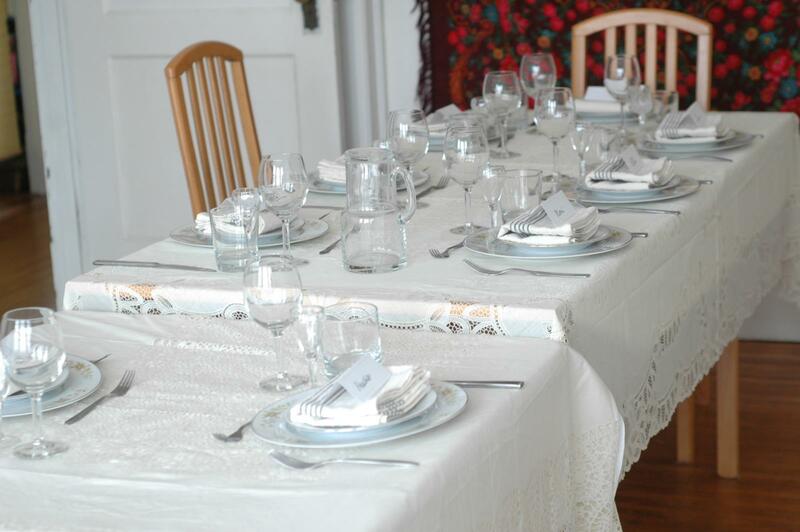 The recipes and instructions are thorough and Zuckerman covers a variety of desserts, from cakes and tarts to souffles and syrups. She also provides a great deal of information on baking and pastry making techniques, offers suggestions for modifying recipes, and indicates exactly what type of kitchen equipment you’ll need for each recipe. Her enthusiasm for her craft comes through the pages, and the book is brimming with clever recipes like Basil Ice Cream or Goat Cheese Cake with Hazelnut Brittle. I decided to go with the Date Cake with Toffee Sauce. The recipes require very little prep work. 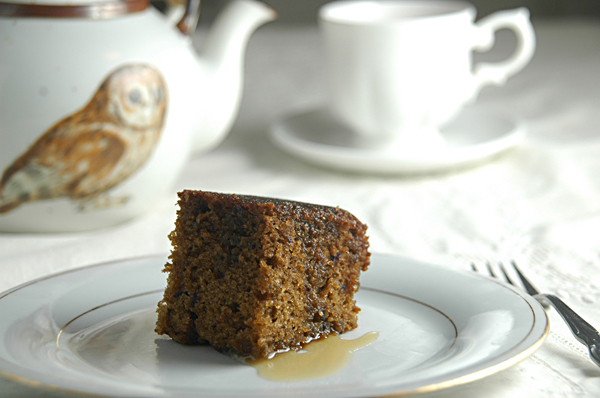 The rich flavor of Medjool dates and spices is balanced nicely with espresso and brandy in the cake, while the toffee syrup (also with brandy) is so gooey and delicious that I want to pour it on absolutely everything. Both recipes are available on Cookstr, so rather than duplicate efforts please refer to the links below. – I cut the quantities in half when trying out the recipes, which yielded a delicious and fluffy 5×5 inch pan. Unless you are making the cake for a large party, I actually recommend you do that. It’s only supposed to sit covered at room temperature for 3-4 days max. But maybe you can eat a whole giant cake! – I did not use a stand mixer. I just mixed everything by hand. The butter and sugar I creamed with a fork, and then everything else I mixed with a wooden spoon. This isn’t out of some old fashioned purist approach but because my stand mixer is very big and heavy and I have to haul it out of the side closet to use it, since there is no room to keep it on the kitchen counter permanently. – I used Raynal VSOP brandy. The flavors of dates, sugar, spices and coffee are strong enough on their own not to require a flavorful cognac like Grand Marnier. Although I’m sure it would taste delicious, so if you like some extra decadence, go for it. Everything else is super straight forward. Word of caution: you will have a very hard time resisting the urge to constantly lick the mixing spoon when making the toffee syrup. Pkhali (ფხალი) is a Georgian appetizer that is somewhere between a salad and a spread. While the recipe I’m sharing here is made with beets, pkhali can also be made with spinach, cabbage, or green beans, for instance. 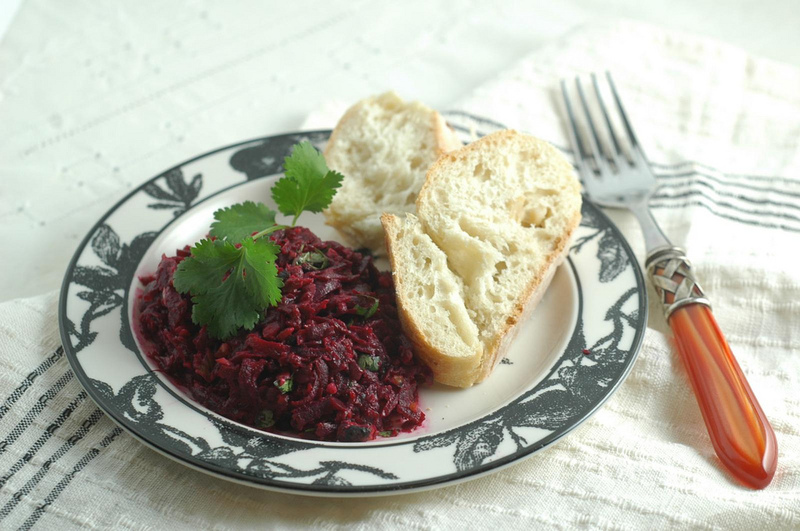 It’s great when spread on a slice of country bread, or as a side dish. I’ve slightly modified the recipe from the one my mother follows by replacing mayonnaise with Greek yogurt. 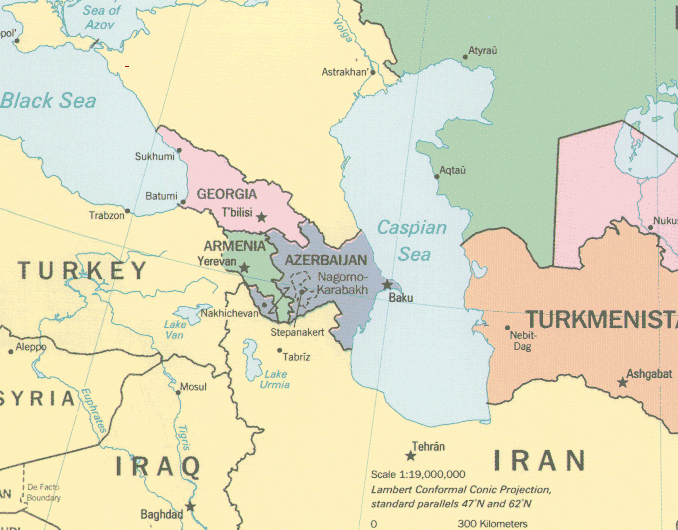 So on this here map, you can see Azerbaijan right on the Caspian sea, which is where I spent some of my childhood, and its neighbor is Georgia. The climate is about the same: temperate and subtropical, with dry plains and lush mountains here or there, getting milder as you border the sea. Two other items from Georgian cuisine that I absolutely love: khachapuri, which is a cheese filled leavened bread, and kharcho, a spicy and garlicky tomato based beef stew. What else can I tell you about Georgia? I’ve never been unfortunately, but there were a lot of people from Georgia living in Azerbaijan when I was a kid. I love the country’s folk music, and some of my favorite Soviet-era films were directed by Georgi Daneliya, who was born in Tbilisi.